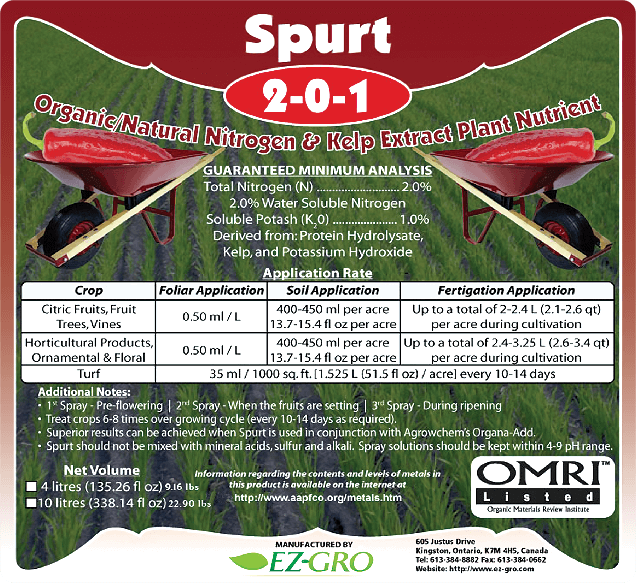 Spurt is a certified organic liquid nutrient based on kelp extract and amino acids. Spurt helps to enlarge the root system of plants, aids in better absorption of nutrients from the soil and promotes overall growth and vitality. Spurt also contains natural biostimulants cytokinin and gibberellin. Use at a rate of 1-2ml per litre (0.8-1.6tsp per gallon) of water once per week or with every feeding after transplant. Use at a rate of 2-4ml per litre (1.6-3.2tsp per gallon) of water twice once week or with every feeding after transplant. Foliar Application (Recommended): Use at a rate of 0.5ml per litre (0.4tsp per gallon) of water and mist plants every 10-14 days.